The Topsan manifold is suitable for both plumbing and heating applications and includes a wheelhead isolating valve for each circuit, making maintenance work on a specific radiator quicker and easier. Using the provided wheelhead, allows correct balancing of the system but temperature control will still be required at the radiator. This method of installation allows for continuous pipe runs between the manifold and radiator with no intermediate concealed joints thus reducing the potential for leaks. Topsan can be mounted vertically or horizontally using single or double mounting brackets or slider rail bracket system and can be mounted either offset above one another or side by side. Can be surface mounted, concealed in a cabinet or within a partition wall. 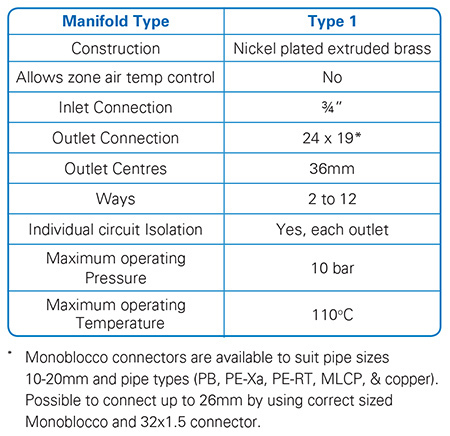 Also available are ball valves, fittings and Monoblocco pipe connectors to accommodate a wide range of pipe types and sizes.